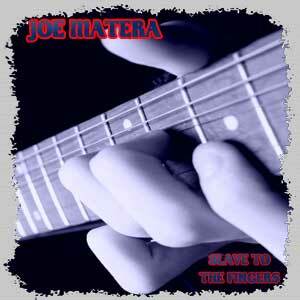 For the majority of rock music fans here in Australia, at some point over the last decade or so, you are bound to have heard, read, or seen Joe Matera? As lead guitarist with Aussie rockers Geisha during their re-emergence during 2007 to 2010 or as founding member of classic rock band Double Vision between 2003 to 2008. As a highly respected music journalist since 1999, Joe has had over 900 articles published in magazines all over the world ranging from Metal Hammer, Classic Rock, Australian Guitar, Total Guitar, Performing Musician, Guitar & Bass…the list goes on! Well that’s all well and good as a reference point, but importantly in the here and now, Joe has recently released an instrumental guitar EP titled Slave To The Fingers featuring four tracks that equally showcase Joe’s abilities as a guitarist and songwriter alike. We recently chatted with Joe about the level of interest being shown in the EP already from all corners of the world, as well as having legendary guitarists such as Rick Brewster (The Angels) and Mick McConnell (Smokie) contributing guest solos on Slave To The Fingers. Hey Joe, thanks for taking the time to chat today! 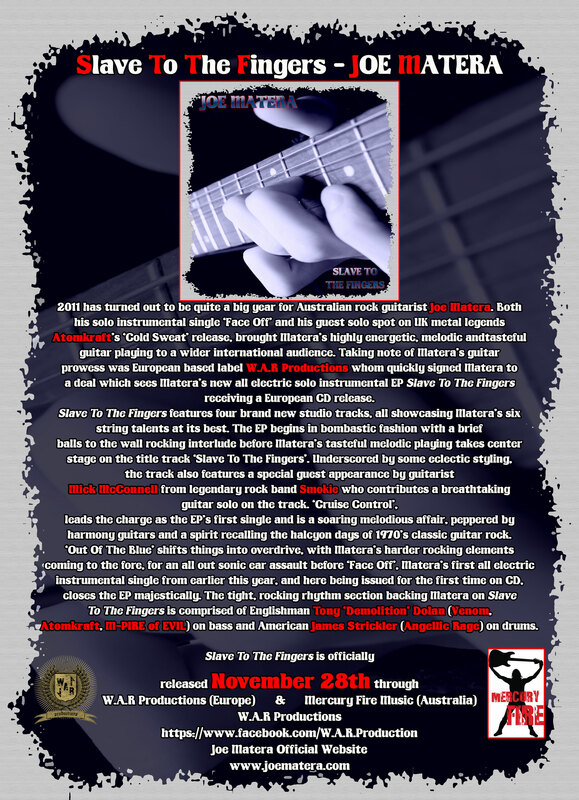 So first things first, let’s get the important stuff out of the way, you have just recently released an instrumental guitar EP titled Slave To The Fingers, it seems you have been getting coverage all over the world for it, you must be happy with the reaction so far? The reaction has been absolutely fantastic overseas, I think I’ve tapped into some market over there. People are really digging it, I’ve been getting some airplay and the reviews have been fantastic too, it’s just great to have something out there that people enjoy. Instrumental music in itself is not a mainstream type thing, it can be really hard to get people interested in that kind of stuff. What I’ve found here in Australia, is radio stations for example have a really specific format that they have to stick to. Over in Europe, radio stations and just the audiences themselves, they’re very open to any kind of music that’s different and they embrace it. The album has been released on an Austrian label W.A.R Productions…how did you get mixed up with them? Yes it’s called W.A.R Productions and his name is Alex and he’s been running it for about 16 years and had a number of releases, I think mine is about 68 on his label. He’s been fantastic, he’s set up all the promo over there and he’s paid for the release and that kind of stuff. There are all these little labels around the world that do really good things for musicians. My experience with this label is that the way these smaller labels operate, the bigger labels should really have a look at them to investigate how they operate. Alex is all about the music and the best you can do and give to the people, it’s a real passion. As far as the style of tracks on the EP, they are certainly very song focussed, as opposed to merely unleashing your guitar playing arsenal of tricks. Was this a prime focus of what you wanted with this EP? Yes it was. That is how I craft my instrumentals, I think of the song itself and melody is very important to me, it’s got to have a melody and something you can hum and have something stuck in your head. Having no vocals, you’ve got to be able to tell a story, with guitar instrumentals you’ve got to be able to tell the same story that a vocalist can. Your previous solo releases have been predominantly acoustic based, this EP has gone down the electric path. What led to this change? Well I released my first solo single which was an acoustic track titled Travellin’ West, which got some really good interest. Then I started work on my electric stuff, which is where my heart really is. I was already planning on doing an EP, however I worked on Face Off and released it and tested the waters with that. It got a really good response and I kept working away, wrote all these songs and basically put out the EP. So what’s out now is basically what I’ve come up with in the past year. Well that whole chord progression for Face Off came to me in about 10 minutes. I just sat down with that chord progression, and then the main riff came out and then kept building it upon that. Cruise Control, that was a similar thing too. I basically wrote that on the acoustic guitar, the whole chord progression and then when I transferred it to the electric guitar, I changed it around a bit, refined it, made it set up better on the electric guitar, that’s why it’s very song oriented. You had a real worldwide involvement on the CD with contributors from the UK and USA, so tell us how did you go about recording the tracks, was it the result of the wonders of modern technology? As you said, the technology of today opens up a whole new world for people. You can do stuff with one person on one side of the world and another on the complete opposite side of the world. I basically did all my demos here in my studio and sent them off to my drummer in the USA, James Strickler who laid down all the drums for me and we swapped ideas and that kind of stuff. Once they were down I redid a lot of the guitars and sent them off to Tony Dolan in the UK who I’ve known for many years. He laid down the bass and when that was all done I sent off Slave To The Fingers to Mick McConnell from Smokie, which is a really interesting story. When he was going to do that solo he told me I’m going to head to the studio tomorrow in London and what I want you to do is hook up to Skype, as I have a camera set up and I want you to watch me record that solo. So I watched the whole thing being laid down, he spent about half an hour doing it and I saw the whole thing being recorded which was just amazing. So it definitely opened up a whole heap of opportunities to do many things. You also have Rick Brewster guesting on the track Face Off, how much of an influence has Rick been on your own evolution over the years as a guitar player? Yes Rick did a great job on that. I sent him a demo of the track, which at that time had a different name, it just had the main melody and chord progression and there was a little spot in there, which I thought Rick could do a great solo. He had it for a week and then sent back this solo and I was like: “wow, that’s fantastic”. I only had about half of the lead parts already done. When I heard his solo I thought, this is exactly what I wanted in that particular area. So I basically then finished off the track and it just fitted perfectly. I’ve always loved The Angels and Ricks playing. He is one of those guys that when he plays it’s very melodic and going back to that initial discussion about melodic guitar playing, it’s about having a solo, but having It say something, rather than just going off doing different solos or licks. Rick has always been very strong on that element of guitar playing. Putting you a bit on the spot here, what sticks out as some of your own personal favourite guitar instrumental albums? My favourite one and it may surprise you, it’s actually The Shadows 20 Greatest Hits. When I was 15 and learning guitar I learnt a lot of The Shadows stuff, so I’ve always had that album. But one of my main rock ones would have to be Flying In A Blue Dream by Joe Satriani, that’s just a great, great instrumental album that one. Ok, so here’s a standard question…influences. Firstly, guitar playing wise, who have been some of your biggest influences? Well one of the main reasons why I play guitar is because of Ace Frehley. Eric Clapton is another, then Gary Moore, Jeff Beck who has a really unique approach to the guitar. Joe Satriani is one who I’ve always loved his sense of melody and solos. Mark Knopfler from Dire Straits is another, I mean you can almost hum that whole solo in Sultans Of Swing from start to end. Tom Scholz from Boston is another who’s right up there. And as far as song writing is concerned, who have been some of the writers/bands you admire? Bryan Adams is one who I just love he way he writes songs. Rick Nielsen from Cheap Trick, a lot of those songs he wrote are just classic rock/pop songs now really. Then there’s stuff like The Beatles and Badfinger and of course there’s The Angels and the way they craft their songs. So it’s pretty diverse really. Back when you first started learning guitar, obviously the world was a far different place, with no websites and YouTube etc to assist guitar players to learn. How did you primarily learn, was it basically all ear based? Absolutely! I used to get my vinyl collection and just slow them down and just play them over and over again until I worked out the songs by ear. What that did basically was it developed my ear in the sense that now I can listen to something once through without even having a guitar in my hand and pick it up. So that was the beauty of that, but in a sense it was also very hard because it’s tedious and a long process. These days with the Internet, I think is a great thing that kids can sit down and watch a YouTube video and play guitar and you can learn quicker. I still think the most important thing is you have to interact with another person. Even though I did that by ear, where I learnt the most was playing with other musicians and finding all my strengths and weaknesses. Just touching a bit now on your music journalism background, I can’t help but ask this question, what’s easier for you, being interviewed, or being the interviewer? Oh, that’s actually a really good question, I’ve never been asked that one before. I think being interviewed is easier because you are taking about what you want to be talking about. Interviewing someone else, well in the early days I would get a little starstruck thinking oh my god I’m going to be interviewing this guy, but over time, it’s just nothing, now that I’ve done hundreds. As long as you are well researched and you know your stuff, I don’t really find it any harder than any of the other stuff I do really, it’s just something that do. Well on the EP was my signature model Haywire guitar (www.haywireguitars.com). Which was made by US guitar maker Rick Mariner who made this Strat style guitar based on my own specifications. As for pick ups, I’ve just started being endorsed by Larry DiMarzio, whilst I’ve been using them on my main guitars for a while, now they’ve outfitted all my guitars which is really cool. I’m also endorsed by Grover Allman picks (www.groverallman.com.au), which are amazing picks to use. The only amps I’ve been using over the last 20 years, I’ve been endorsed by Laney amplification. Then lastly, string wise I’ve been endorsed by La Bella strings exclusively! Have you been playing the Haywire guitars for a while? For about 18 months now. It’s a great guitar and gives me pretty much everything I want in a guitar anyway. I’ve got a couple of Fender Strats that I use as a backup for live work, but everything on the EP comes courtesy of the Haywire!. So putting you on the spot again, what do you have to say about Australia as guitar playing nation? Well I think for starters we are very lucky as a country to have the quality of musicians and bands that we do. My only disappointment I guess is that we don’t really support our own musicians enough. You look at someone like AC/DC, they had to break overseas, before they were taken for real I suppose. But I think we have a really healthy, thriving music scene and there’s a lot of awesome guitar players around, especially here in Melbourne. I think the key thing is to support each other and be proud when a fellow local musician does something on a bigger scale. It all helps cultivate the next generation of artists. So looking forward over the course of 2012, can we expect to see you doing many live shows in support of the EP, either here locally, or over in Europe? Well I’m going to be heading off doing my first European Tour in September actually. I’m going to be playing Austria, UK, Scotland and possibly Germany at the moment. The dates are still being confirmed, but I’m obviously really, really excited. The interest over there is really, really growing so I just want to go over there and play some shows. I’ve got a band over there, my bass player is there and some other musicians I’ll play with. As for Melbourne, I am planning some small acoustic shows at the moment, but I’ll see how that goes. I’ll do some shows, but I just don’t know exactly when, but they are in the pipeline. Obviously it’s probably a fair comment to say when you started with the EP a Europe tour was probably the last thing you expected? Exactly! When I started the EP, I was just happy to get my music out there and see how it all evolved from that. Its just taken off and it’s fantastic. In the meantime whilst I am still doing promotion for the EP, I’ve also been working on new material for another EP or actually an album of instrumental stuff. I’ve also hooked up with a UK singer called Rich Davenport and we are co-writing a complete rock album. It’s going to be in the style of Thin Lizzy meets Cheap Trick. That’s coming out on the same label later this year. So what’s going to happen is that when I go overseas I’ll do my set with the instrumental tracks, then well do a Davenport/Matera set as well, so I get to kill two birds with the one stone so to speak!